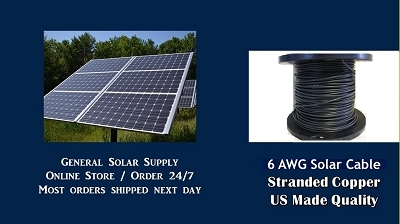 Bulk Solar Cable 6awg made in USA and UL approved. This solar wiring cable is meant for either longer runs or shorter runs with high amperage. This is very heavy duty solar wire that has extreme resilience to temperature, ultra violet waves, oil, gas, and more. Bulk Solar PV Cable 6awg for wiring solar devices, and other uses that require tough duty cable.